Past the Post slot by Eyecon, has created an outburst of excitement at Moon Games Casino! 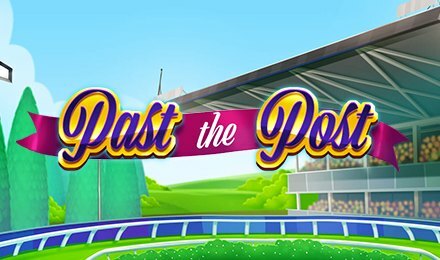 Themed on horse racing events, Past the Post slot comes designed with 5 reels and 243 ways to win! The slot grid is embellished with ever green reels and well-designed symbols to take part in the gameplay. While spinning the reels of Past the Post slot, symbols you see landing on the reels are: Jockeys, Grey Horses, Golden Horses, Grumpy Horses, Happy Horses, Champagne Bottles, Lady Watchers, Man Watchers and a Horse Owner. Kick off your gameplay on the Bet Field by setting your stakes then start spinning! The aim is to make 3, 4 or 5 symbol combinations on active paylines. The Autoplay option also comes handy while you watch the show! Select a number of Auto Spins to put to play hands free! Amount of Paylines Selection: 243 paylines remain active throughout the game. Coin Values: Coin values range from the minimum of £0.25 to the maximum bet of £50.00. The wild takes form of the Trophy, which replaces all other symbols except the scatter symbol. When it forms part of a winning combination, your wins are doubled. This symbol appears on only reels 2, 3 and 4. Three, four or five Tote symbols trigger the Free Games Feature where all prizes are tripled. Then, you’re presented by five free game horse selections. You could win 5, 8, 10, 15 or 20 free games to put to play. Launch Past the Post slot at Moon Games Casino now, and enjoy the theme, scenery and stress how punter wait for their horses to cut the line! Enjoy this game on your mobile, desktop or tablet any time at Moon Games.